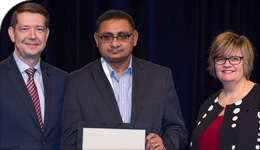 The Human Resources Professionals Association (HRPA) has bestowed York University Professor Parbudyal Singh with its inaugural Distinguished Human Resources Professional (DHRP) Award. Singh teaches in the School of Human Resource Management (HRM), where he previously served as director. The school, in York University’s Faculty of Liberal Arts & Professional Studies, is the largest university level institution in the field in North America. The DHRP Award is granted to those who have made a significant contribution to HR through developing and sharing innovative ideas, practices and policies; demonstrating a strong history of service to HR Associations and the broader community; and publishing work in their area of HR expertise. Singh, says the HRPA, is a leader in his field who embodies these criteria and more. Singh has more than 100 refereed publications, including articles in the leading HR management journals, and is co-author of two of Canada’s leading university textbooks in his field: Managing Human Resources and Strategic Compensation. He has been a recipient of several awards at York, including the Dean’s Award of Excellence in Teaching and the Dean’s Award for Outstanding Research. He has advised more than 30 of Canada’s leading organizations, and has also volunteered for organizations, such as the Government of Ontario, Pay Equity Commission, the HRPA, SSHRC and the York Regional District School Board. In 2016, the Minister of Labour appointed Singh as one of four people to examine Ontario’s gender pay gap. The result was a 2017 report that laid some of the foundations for the government’s Women’s Economic Empowerment Strategy. For more information on the Distinguished HR Professional Award, visit HRPA Awards of Distinction.